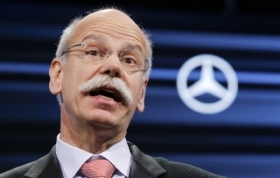 Dieter Zetsche has vowed to make Mercedes the No. 1 luxury global brand again. BERLIN (Bloomberg) -- Daimler investors value the Mercedes-Benz cars unit at half what rival BMW is worth as CEO Dieter Zetsche seeks to reclaim the title of world's biggest luxury carmaker. Market capitalization at BMW has surged to 45 billion euros ($58.8 billion), versus 42.2 billion for Daimler. With the subtraction of a reasonable price for Daimler's truck business -- the world's biggest -- the value investors assign to Mercedes passenger cars stands at about 25 billion euros. "The market is saying that the prospects for Mercedes are much worse than for BMW," said Hans-Peter Wodniok, an analyst with Fairesearch in Kronberg, Germany. "The market's always right. In terms of innovation, BMW is the leader." Lagging growth in China, sluggish expansion into popular segments like compact SUVs, and an image that lacks appeal for younger drivers have hindered the Mercedes marque, allowing the BMW and Audi brands to widen their sales lead in the luxury segment. The growing gap comes a year after Zetsche, whose current contract expires at the end of 2013, vowed to almost double deliveries to 2.6 million vehicles by the end of the decade and regain the top spot, which Mercedes ceded in 2005. The push has gotten off to a rocky start. Zetsche postponed a longstanding Mercedes profit goal in October, putting the target at least four years behind its original schedule. After earnings slumped this year, Mercedes initiated a drive to cut costs by 2 billion euros by 2014 under a program dubbed "Fit for Leadership." BMW's surge has overturned the historical pecking order in the German auto industry. Daimler, which tried to take over BMW in 1960, had a market capitalization 15.5 billion euros higher than BMW's just two years ago. Today, assuming a price of roughly 20 billion euros for its truck business based on comparisons with rival truckmaker Volvo AB, investors value Mercedes at 22 billion euros, or less than half BMW's worth, according to Bernstein Research. "The market's confidence in Daimler management is pretty much at rock bottom," said Max Warburton, a Bernstein analyst in Singapore. "Investors have little or no confidence that current management will be able to do what is necessary to close the gap to BMW." Unruffled by the debt crisis in Europe, BMW continues to expand, planning a new factory in Brazil and readying models for 2013 like the 4-series coupe and the electric-powered i3 city car. Through November of this year, BMW sold 1.39 million vehicles versus 1.19 million for Mercedes, widening its lead to 193,400 cars for the period from 115,700 a year earlier. BMW booked 6.41 billion euros in operating profit for the first nine months of 2012, 112 million euros more than Daimler even though revenue for the Mercedes parent was 28.2 billion euros -- 50 percent -- higher. "BMW earns more with just cars than Daimler does with cars and trucks," said Juergen Meyer, a portfolio manager at SEB Asset Management in Frankfurt. "For us investors, profit counts." Since Zetsche took over as CEO in 2006, Daimler shares have slipped about 10 percent while BMW's have surged 89 percent. BMW trades at 9.1 times next year's earnings, versus 8.3 times for Daimler. About 68 percent of analysts rating BMW recommend buying its shares, compared with 40 percent for Daimler, according to data compiled by Bloomberg. Daimler is moving to catch up. Next year, it will overhaul the Mercedes S-class flagship and introduce the CLA compact four-door coupe to attract entry-level drivers. The manufacturer pressed ahead with an exit from European Aeronautic, Defence & Space Co., the parent of plane manufacturer Airbus, as part of Zetsche's efforts to focus Daimler on its automaking roots. It is also deepening cooperation with Renault to cut costs. "We have very clear strategies for all our divisions focused on both growth and efficiency," said Florian Martens, a spokesman for Daimler. To revive growth in China, where Mercedes has lagged BMW and Audi, Daimler this week appointed Hubertus Troska to a new management board position to oversee operations in the world's largest car market. As part of the effort, Daimler is combining two separate sales units -- one for imported vehicles and another for locally made cars -- into a single entity. Audi, the luxury-car leader in China, can draw on Volkswagen's resources in the country to expand. And BMW opened a new factory in Tiexi as part of a plan to quadruple production to as many as 400,000 vehicles in the country. Nonetheless, the potential of the Mercedes brand in China is ''overwhelming," said Yale Zhang, managing director of consultancy Automotive Foresight in Shanghai. He added: "Every consumer understands the value of Mercedes and the logo."